I have a very strict policy of only using photos taken of or in the 5 boroughs of New York City. And being away on vacation is no excuse to use photos of another locale. I prepare for this in advance. However, the mini-event that occurred on Saturday was so outrageous to me from a New Yorker's perspective, that I have to break my rules and tell this tale. While away this weekend, my two nephews and a friend decided to go for a short canoe ride in a river at my parents gated condo community. They asked if I suggested wearing shorts rather than pants in the event they get wet. My response was that if they were to fall into a river, shorts versus pants would not be a consideration. BUT, I did highly recommend emptying their pockets of valuables, particularly knowing they were affluent boys and the contents of their pockets was probably greater than that of many 3rd world countries. They saw the sense of this and immediately concurred. So out came the iPhones, cellphones, a wallet with credit cards visible and a Gucci wallet. 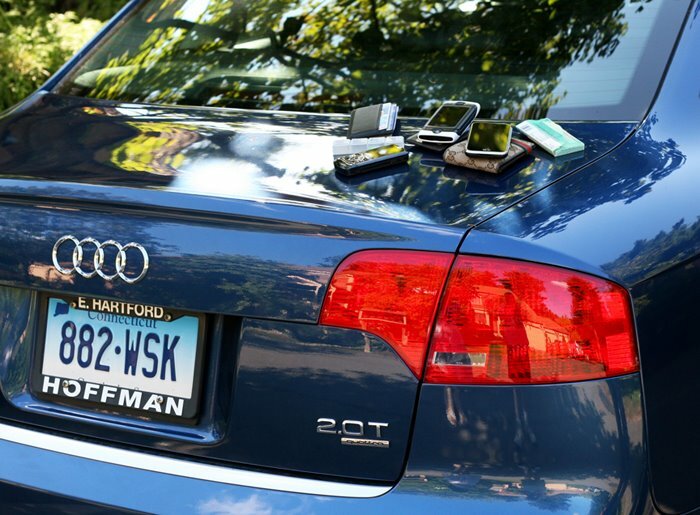 They placed all of these items on the BACK OF THE CAR IN PLAIN VIEW (appropriately on the hood of one boy's Audi). I was incredulous. "You guys are going to leave all this outside in plain view?" I asked. They responded "Whose going to take it? There's only a bunch of old people here." That was not strictly true and I am still absolutely floored by this occurrence. Now admittedly, this cavalier attitude was largely due to a lifetime of privilege and never knowing need. And it was a gated community. But there was also an element of TRUST that is just nonexistent in New York City. You can not leave anything of value unattended. I have heard stories of thefts that are unfathomable - a UPS driver once told me of a man that ran down the street with a large projection television stolen from his truck! The driver was unable to catch him in the ensuing chase. In New York City, a vehicle should always be locked and nothing of value should be in plain view. This process is so automatic to me it has become a reflex action - I even lock my car in the driveway of my parents home in the suburbs. Every seasoned New Yorker remembers a time when auto break ins for radios were common. At one time I recall seeing broken glass somewhere on the streets on nearly a daily basis - a tell tale sign of a recent break in. Soon the ubiquitous "NO RADIO" signs in the windows of cars started to become a common sight - a plea to the would be thief that a particular car was not a worthwhile target.